Found 15 file extension associations related to Procomm Plus and 14 file formats developed specifically for use with Procomm Plus. Procomm Plus is a terminal emulation and file transfer software. There's more to the Internet than surfing sites, downloading music, and buying stuff. 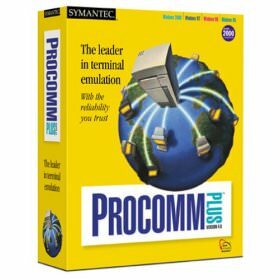 Procomm Plus, a must-have shareware application back in the pre-Web days, still fulfills its functions of old, allowing users to telnet (which is useful for, say, configuring a router), dial in to BBS's (bulletin board systems for the uninitiated; these used to be the equivalent of personal Web pages and download servers), and more. In addition, Procomm Plus is a powerful terminal emulator, offering support for three dozen terminals. It also features a fax applet, FTP ability, an e-mail program, and even a Usenet news reader. If you need more information please contact the developers of Procomm Plus (Symantec Corporation), or check out their product website.